This is my go-to smoothie recipe. 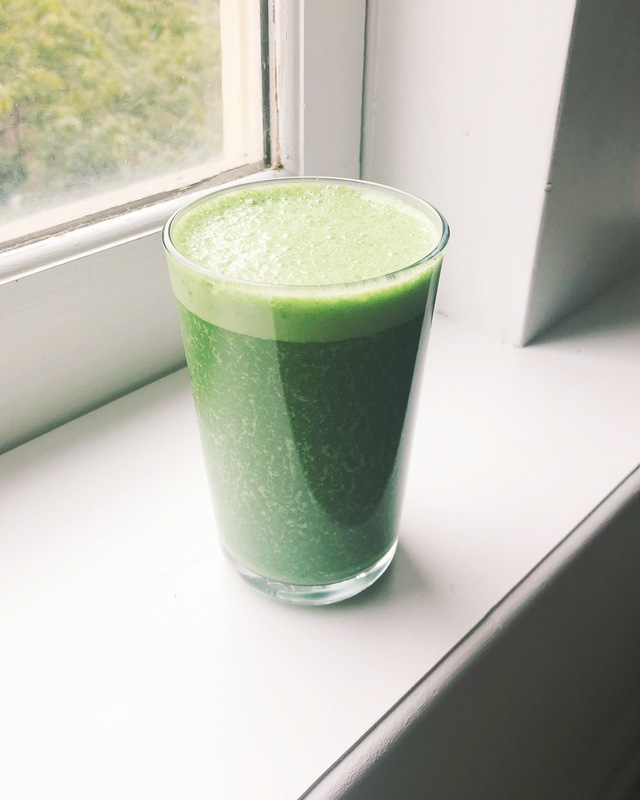 It’s the perfect way for me to start my day because I prefer to eat fruit in the morning on an empty stomach for better digestion and I like to start the day off on the right food with leafy greens. I’ve gone through phases of making undesirable smoothies with protein powders, steamed cauliflower, or very little fruit. Enough is enough. I decided to make a delicious smoothie with the most delicious ingredients nature has to offer. Almond and Macadamia Nut Milk – An important component for a delicious smoothie is the nut milk. Purchasing milk is easy but it’s also more expensive and can taste watery. Making nut milk is so simple that I’ve decided to make it part of my weekly routine. It’s also nice to know exactly what goes into my milk. Try out my almond and macadamia nut milk recipe below for a real creamy treat. Spinach – is the best vegetable choice for a smoothie because its very mild in flavour and gives your smoothie that beautiful healthy green hue. Ripe Banana – Go ahead and enjoy an entire one. It’s natures candy and makes for a sweet and creamy smoothie. I prefer my bananas to be either room temperature or cold from the fridge, this way the smoothie is more of a creamy milk. However, if you prefer an icy smoothie, peel and store your ripe bananas in the freezer. Spiruluna – I love spirulina because with just 1 teaspoon added to a smoothie it’s tasty. Spirulina is one of the healthiest foods on the planet. It’s a powdered algae that is packed with protein, anti-oxidants, and is anti-inflammatory. I swear by this brand HealthForce Superfoods Spirulina. You can find another one of my spirulina recipes here. Ginger – it gives your smoothie that delicious zing. It’s also good for digestion. Combine all the ingredients in a high speed blender. Blend on high for 40 seconds. Strain with a fine mesh strainer or nut milk bag. Refrigerate up to 3-5 days. You can save nut pulp for other uses or toss. Place all ingredients in a high speed blender. Blend until smooth and creamy! This entry was posted in Breakfast and tagged almond milk, bananas, breakfast, fruit, greens, healthy, homemade, macadamia milk, nut milk, smoothie, spinach, spirulina. Bookmark the permalink.